For the first time ever this month, the MammalWeb UK project had 100% of it's camera trap photos classified! This is a huge acheivement and we'd like to thank everyone who has helped classify these images. In this newsletter ,we highlight some of the findings from the MammalWeb UK project so far. We'd like to encourage everyone to keep classifying - as the more classifications we can get, the more confident we can be of the species pictured in any image sequence. Also in this newsletter: you can find out how you could win one of three camera traps; we have an update from NatureSpy on their North York Moors project; and we announce a new project coming soon. These values include all photos from the general MammalWeb UK project, and our other public projects. Thank you to everyone who has uploaded and classified photos this month. Following the success of our Christmas competition, we are excited to announce that we will soon be running an Easter spotting competition! Starting today (Wednesday the 10th of April), we will be adding some novelty, Easter-themed pictures into the MammalWeb UK data set. If you find one, save it to your local device, classify it as “Other” and email it to us at info@PROTECTED. Everyone who finds one will get an honourable mention when we announce the results. We are particularly grateful to our friends at NatureSpy, who have very generously donated three Browning Command Ops Pro camera traps as prizes for this competition. This incredible generosity means that we can offer one of these camera traps as a prize to each of the first three Spotters who send us the novelty Easter photo that they found (up to a limit of one camera per person)! NatureSpy will also be offering discounts on camera traps to MammalWeb participants. Check out their shop here, and watch for further news on how to access the discounts soon! In March, we reached a major milestone. 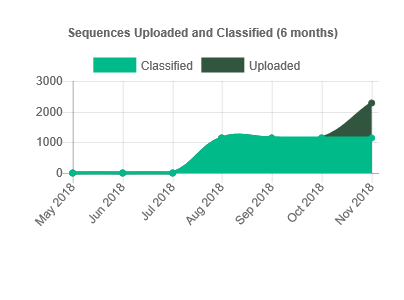 Specifically, for the first time since the MammalWeb UK project began, we reached a point at which every image sequence submitted to the MammalWeb UK project had been classified at least once! This is a great achievement and we’d like to thank everyone who has contributed classifications, as well as Helen, whose tireless work on the web platform has made Spotting such an effortless (and, we think, addictive) process! Although MammalWeb UK is now just one of the projects on the site, it remains the project to which most people contribute data. At the point when all sequences had been classified at least once, it included almost 80,000 sequences from over 300 sites. As you can see from the detailed map (in which the MammalWeb UK sites are shown in red, overlying blue sites from other projects), survey efforts remain dominated by sites in the North East of England, where the project began. Zooming out to the UK map, however, you can see that MammalWeb UK is continuing to expand. If you are, or know, a camera trapper elsewhere in the country, please do upload your camera trap photos/encourage others to do so. This way we can continue to expand our coverage, and consequently learn more about mammal ecology across the UK. At the point at which all image sequences had been classified at least once, the data suggest that about 62% of the sequences contained identifiable animal life. So, what do they contain? As you can see from the graph on the left below, the most frequently sighted animal is the grey squirrel which, as many of you will know, is an invasive non-native species. Nevertheless, there are a number of native species that appear frequently, including roe deer in about 1 in every 12 sequences you view, and badger or red fox in about 1 in 18 sequences. Bear in mind that these statistics are based on what species people have said are in sequences. As we get more classifications per sequence and more conviction regarding what is pictured, this could change. A more intriguing picture arises when we consider the number of sites at which different species have been photographed (see graph on the right below). This suggests that roe deer and red fox are actually more geographically widespread in our data than are grey squirrels. This probably arises because they are more wide-ranging: when grey squirrels are active around a camera, they are usually very busy, generating lots of image sequences; roe deer and red foxes turn up at more cameras – but don’t linger by the camera for so long. As contributors are increasingly trapping in other parts of the country, these patterns will almost certainly change. We have recently seen muntjac in the data set from a site in Worcestershire, as well as fallow deer from a site in South Wales. Who knows what other species we might see as the project continues to expand? 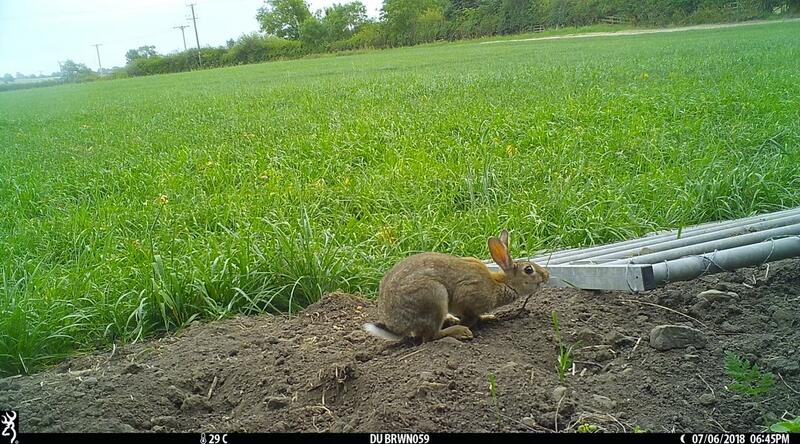 The response to NatureSpy’s camera trap images on MammalWeb has been amazing! We’re currently uploading around 2,000 images per month from cameras used in the Yorkshire Pine Marten Support Programme, most of which have been classified within a few weeks. We’d like to take this opportunity to thank the keen Spotters of MammalWeb for doing such a great job of ID’ing the species in our photos! We’ve now been uploading images to MammalWeb for almost one year, this is a great point for us to take a look at our species list so far. Any efforts to identify the remaining sequences on MammalWeb in the coming weeks would be appreciated as it gives us a complete dataset to look at. We’ll report our findings on the NatureSpy website in the near future! If you’d like to learn more about our pine marten work on the North York Moors, we post compilation videos of species, as well as species spotlight videos on the project webpage, which can be found here. Some of you might have noticed that we have a new project on the project pages, entitled “Scottish Wildcats”. As many of you know, the Scottish wildcat is one of Britain’s most endangered mammals. Owing, in particular, to genetic dilution by domestic cats, it is unlikely that the Scottish wildcat population is sustainable now without intensive intervention. Scottish Wildcat Action (SWA) is the umbrella group that has been monitoring the wildcat’s plight, and both developing and delivering plans for the species’ conservation. Over several winters, they have been organising surveys using baited camera traps to check for wildcat presence in a number of priority areas. They have amassed a large bank of camera trap images which has been screened for potential wildcats but which, otherwise, has been largely under-exploited for the information it contains. That information includes insights into the prevalence of domestic cats, and information about the ecological context in the different areas (including the presence of competitors and prey). Over coming months, SWA will be uploading images from their six priority regions in Scotland to MammalWeb, in the hope that Spotters will help them to classify what’s in the pictures. They have already put up about 1400 sequences from a small number of camera deployments, so you will be able to see the types of species attracted to their bait. The early signs are that this is likely to be a great project for spotting predators! Have a look, and watch this space for plenty more images. If you own a camera trap and live in an area that could have wildcats, you will also be able to contribute to these surveys. More details to follow. Sian, a PhD student working on MammalWeb, has recently written an article for 'The Conversation'. 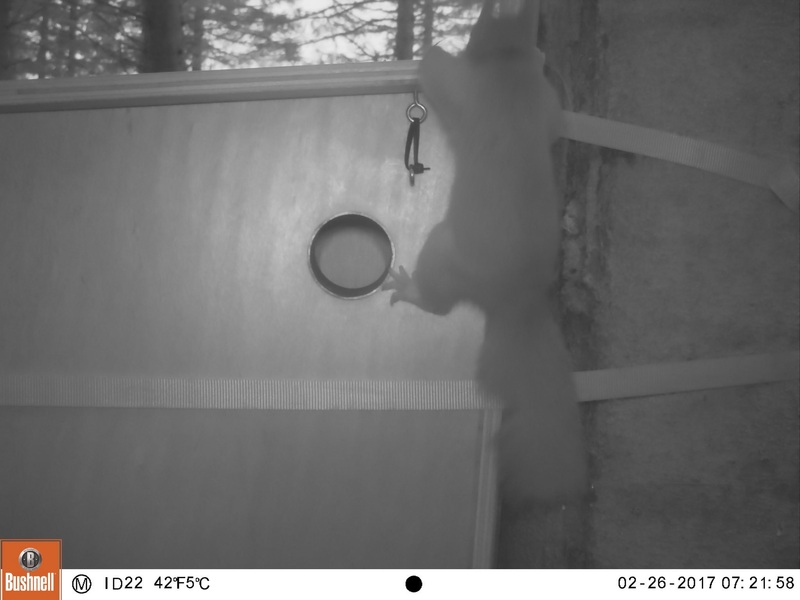 The article outlines why mammal monitoring is important and how MammalWeb is helping to build a better understanding of UK mammals through camera trapping. The article also highlights some of the findings from numerous projects on MammalWeb so far. To read the article click here. Many of our long-standing contributors will know Pen, who was heavily-involved in MammalWeb’s transition from a campus-based trial to a public-facing project. You might also know that Pen recently successfully defended his PhD thesis on “Monitoring the UK’s wild mammals: A new grammar for citizen science engagement and ecology”. Pen has just returned to Taiwan, prior to starting a job in the USA. He will be missed by the whole team and many more who were motivated by his infectious enthusiasm. We will be keeping in touch, however, and this is not the end of Pen’s involvement with MammalWeb! In the meantime, we wish him safe travels and every success in his new job. Thank you for all your efforts this month, and please don't hesitate to get in touch! This month we have two new exciting projects to tell you about! Each project involves working with 50 schools across the North-East; consequently, over the course of the next year we will hopefully have camera traps out at up to 100 new sites! We're sure the schools are going to capture some great images over the next year, and we hope that all our spotters enjoying classifying the photos from these projects. Read on to find out more about each project and how you can view and classify the photos from them. Over the past month we have been continuing with some essential IT upgrades. At times, this maintenance has meant that the site has been running slowly, so we thank you for your patience. We're hoping that further updates, as well as actions now taken to hide data from web crawlers will improve the performance and speed of the site. This month we have also switched to HTTPS. This means that communication between your browser and our website is encrypted. Another change to the website is the addition of the "Classify This Project" button on our Projects page. This means that you can directly go to spotting images from any particular project from their project page (see further, below). More modifications are due soon, both to make it easier to classify the images on the website and to see what we are finding. Watch this space! The iconic Diplodocus cast, 'Dippy', that once stood in the Hintze hall of the Natural History Museum in London, is currently on tour! Dippy has already visited Dorset, Birmingham and Belfast, and is set to visit the Hancock Museum in Newcastle from the 18/05/2019 to the 06/10/2019. You can read more about 'Dippy on tour' here and book tickets to visit Dippy at the Hancock museum here. As well as educating the general public about extinct wildlife, Dippy on tour also aims to educate and to engage people with extant wildlife. As such, we've been working with the Hancock museum on a project where 50 schools across Newcastle, County Durham and Northumberland have been given a camera trap to see what wildlife is in and around their school grounds. The schools involved are in a range of different habitats including upland, lowland, coastal, woodland and urban, and so we hope they will capture some interesting and varied wildlife! The photos captured by the schools will be uploaded to MammalWeb and displayed on screens as part of the exhibition when Dippy arrives at the Hancock museum. There will be an area for each of the five habitats listed previously and members of the public will be invited to help classify the photos captured. 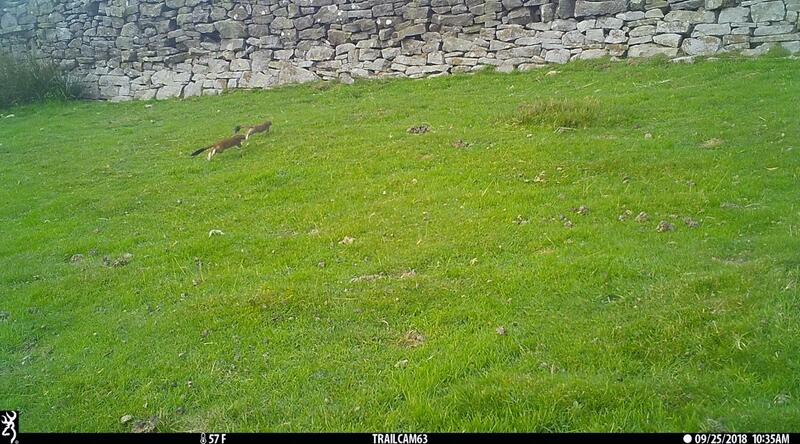 A number of the schools involved have already started to upload their camera trap photos to MammalWeb. As you can see below, they've already captured a variety of species on their camera traps, with red fox currently the most commonly pictured. As a spotter, you can view and help classify these photos. To do this, go to our Projects page and click "More" under the Hancock Museum project. From there you will be able to see how many photos have been uploaded and classified, as well as which species have been classified. If you scroll down you can see the five different habitats where the schools are located, and each school that is involved in the project. You can classify from one particular school, one of the habitats, or the whole Hancock project by clicking the new "Classify This Project" button (circled in red below) which will appear on any projects description. Schools will be continuing to upload to their projects over the coming months and we hope you'll enjoy seeing what the schools have captured. We hope that this project will provide a model for engaging children with the biodiversity immediately around them. The approach will also help us towards our goal of providing ever-greater coverage of the country, in order to see which species occur where, and why. In parallel to working with schools as part of the Dippy on tour project, Sammy (a PhD student working on MammalWeb) is currently collaborating with 50+ schools across the North-East, assessing the impact that being involved in the MammalWeb project has on primary school pupils, and their parents and teachers. Sammy is lending camera traps to schools for one month, and delivering either a training session for teachers or a workshop for pupils. She is asking the school pupils, their parents, and their teachers to fill in questionnaires before and after being involved in MammalWeb. The questionnaires will assess an individual's knowledge of UK mammals and connection to nature, amongst other things. By doing this, Sammy hopes to find out if being involved with MammalWeb has a positive impact on the pupils, parents and/or teachers, and what methods of engagement work best. Many of you will have enjoyed classifying photos from the NatureSpy North York Moors Project over recent months. The officer for the project, Ed Snell, has written a short piece about some of the wildlife they've captured on their camera traps. To read the piece, and watch some videos of the amazing wildlife they've captured, click here. The elusive pine marten has yet to make an appearance, but don't worry: there are still lots of photos to classify, and more on the way - so do keep spotting! The Mammal Society's 65th Spring conference is happening in Glasgow at the end of this month (29/03/2019 to the 31/03/2019). You can buy tickets for the event here. It promises to be a great three days, full of talks and workshops to please all mammal enthusiasts! For the first time ever, we are tantalisingly close to having 100% of the images in the MammalWeb UK project classified! Thank you to everyone who has helped classify these photos, I am sure with your enthusiasm and determination we will be up to 100% in no time. There are lots of exciting projects and developments coming up in the next few months, including more website improvements and increasing our work with schools. Read on to find out more! We are hoping to roll out some more site improvements soon. This will include a "full screen" option, allowing spotters to enlarge the photograph they are classifying to full screen size. We are also exploring the possibility of the site hosting videos. There are many technical hurdles to get over before we can allow trappers to upload videos, but we hope that in the future this will be possible. We'll keep you updated on our progress. As ever, if you have any suggestions for improvements to our site then we would love to hear them! Get in touch by emailing info@PROTECTED. One of our trappers, Roland, has written a report about his findings from camera trapping in his local woods over the past two years. In the report, he writes about the species that have been captured on his camera traps, which he has put out at 62 different locations in the Deerness woods, County Durham. This includes camera traps that he modified to be used to photograph small mammals, which you can read more about on our Projects page, under the "Small Mammal Camera Trapping" project. We'd like to say thank you to Roland for sharing this great report with us, and providing MammalWeb with many lovely photos, such as the ones below, to classify over the last few years! You can find a link to the report on our News page in the article dated 06-02-2019. Last summer many of you helped classify photos in the Highland Red Squirrel Project. The project focussed on the understanding of, and potential mitigation for, forest operations on red squirrels, and was run by a team based at the University of the Highlands and Islands in collaboration with Forest Enterprise Scotland. With your help, all images in the project were classified, and now the team have had chance to analyse the data, they would like to share with you the results! Go to our News page and click on the link in the article dated 07-02-2019 to read the report. MammalWeb is a great tool for encouraging the younger generation to engage with the natural world around them. Therefore, over the past couple of years, members of the MammalWeb team have worked closely with a number of schools across County Durham. If you click here, you can see a video in which, students from Belmont Community School talk about their involvement with the MammalWeb project. Over the next few months, we'll be working with over 50 schools from across the North East on some very exciting projects. 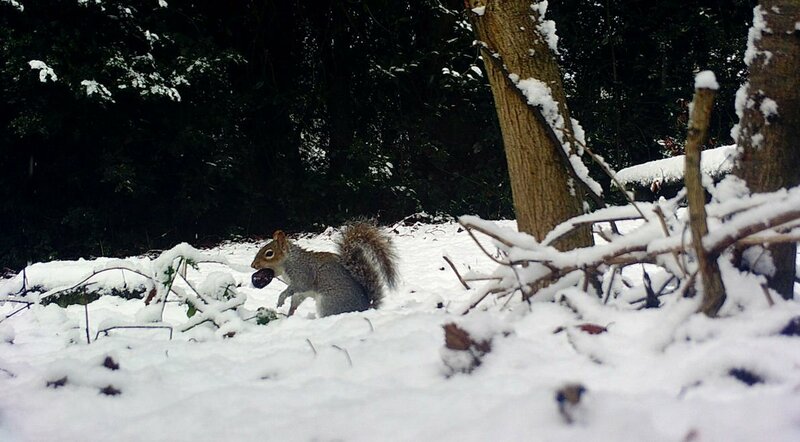 We hope to share more information about these projects with you in our next newsletter, but for now please enjoy this snowy squirrel scene, captured on camera trap by the pupils at Dame Allan's Junior school. There are six species of deer in the UK: roe deer, red deer, fallow deer, Reeve's Muntjac deer, sika deer and chinese water deer. In County Durham, by far the most common deer species we capture on our camera traps is the roe deer. However, as MammalWeb starts to collect images from new camera trap sites across the country, you may come across some different deer species whilst spotting. Telling the difference between deer species can sometimes be tricky, so we've written a News article which should help you to classify deer species correctly. Take a look at our News article dated 06-02-2019, as well as the graphic below to see the differences between deer species. Do you know the location of an active fox's den? Athena Films (http://www.athenafilms.co.uk) are producing a documentary about the natural history of foxes for Channel 5 and are looking to film a fox family at a den this spring. It will follow the moments of fox cub's first emergence to when they become independent. Through the filming we will be telling the stories of individual family members behaviour and characteristics as they grow up. It would be great to hear from anyone who knows of a fox den in a natural looking setting that has been used regularly, and are confident that the den may be used to rear cubs this year. The exact location of the den will not be provided so they can remain undisturbed after filming. The film will be a positive documentary for a family audience fronted by a presenter showing the wonder of foxes by cover aspects of fox behaviour and scientific research. Please contact philip@PROTECTED if you require any more information. We hope you all had a lovely Christmas, and would like to wish you all a very happy new year! 2019 is set to be an exciting year for MammalWeb, with lots of new projects, developments and collaborations on the horizon. We'll aim to keep you up to date with what's going on through this newsletter, on our News page, and on Facebook and Twitter. In this newsletter, we announce the winners of our festive competion, and reflect back on what MammalWeb achieved in 2018, through the efforts of its participants. Hopefully, you will have seen that over the Christmas period, we ran a festive competition to give MammalWeb spotters the chance to win a brand new camera trap! We added the three images below to the MammalWeb UK photo bank, and asked peole to email them in if they came accross them whilst spotting. Over the past month, a fantastic 12,000 photo sequences were classified in the MammalWeb UK project, so thank you to everyone who contributed! All three of our festive photos were found, and the winners were: Elliot Tebbs; Clive Moulding; and Justine Thompson. Congratulations to our three winners, a brand new camera trap is on its way to each of you! 2018 was a very successful year for MammalWeb, with more photos uploaded and classified than ever before, nearly 250 new users registered on the site, and we welcomed five new projects on to the MammalWeb platform. We've put together some facts and figures from the past year, so you can see what you have helped to achieve. Thank you for all the effort you put in to contributing to the MammalWeb project, and we look forward to working with you all in 2019! Thanks to your efforts, we are developing a much better understanding of the strengths and limitations of our data, and of how to analyse them. As a result, 2019 should see an increase in our focus on data analysis and we look forward to updating you on findings from all projects throughout the year. Did you know that MammalWeb has Twitter and Facebook profiles? If you do too, and if you would like to increase your connectivity with people with similar interests, let us know where to find your Twitter profile by emailing info@PROTECTED, and/or follow our Facebook page. By using these social media platforms we can begin to build up a community of those interested in documenting the UK’s mammalian wildlife. Thanks - and a camera trap giveaway! As we approach the end of 2018, we wanted to send a brief note to say a huge THANK YOU to everyone who has contributed to MammalWeb over the past year! It has been a tremendous year for Mammal monitoring in the north east of England – and increasingly further afield. At the start of this year, 70 Trappers had deployed cameras at 227 sites, uploading 55,192 sequences, for which 257 Spotters had submitted 92,972 sequence-classifications (representing 40,374 unique sequences, or 73% of the sequences in the system). 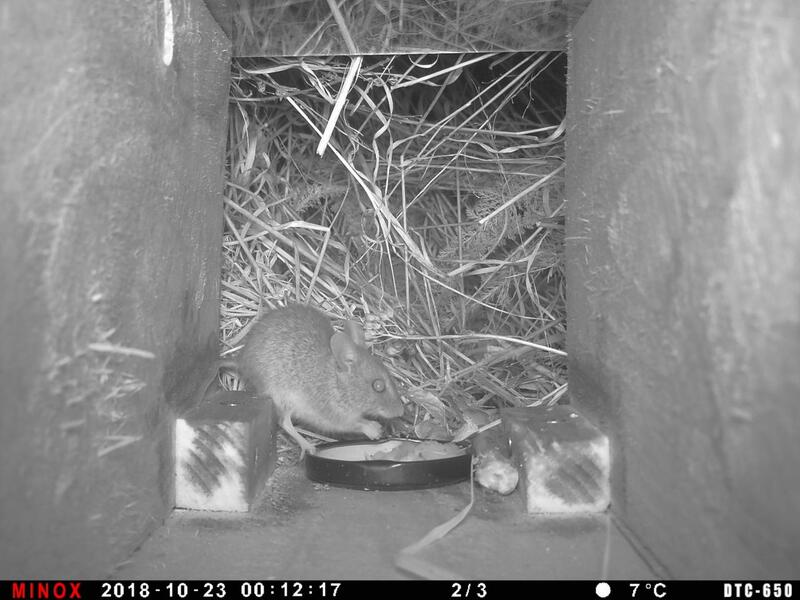 As of today, 97 Trappers have now deployed cameras at 430 sites, uploading 122,742 sequences, for which 473 Spotters have submitted 208,229 sequence-classifications (representing 110,139 unique sequences, or 90% of the sequences in the system). This is tremendous growth in our efforts to find out more about where our wild mammals occur, what they do and what affects that. Next year promises to be much bigger! This year has also seen the publication of our first paper, led by Pen, discussing how we can be confident about what species are pictured in the sequences you trap. This was a collective effort by everyone who has contributed to MammalWeb – so well done to all of you! Another major achievement was Sammy’s rigorous survey of the whole of County Durham. Thanks to everyone who made a huge effort to get so many of the images from that survey classified in such a short space of time! Thanks to you, Sammy was able to present her preliminary results at the recent meeting of the British Ecological Society. You can expect to hear more about that study over the coming year. We have also welcomed two new people – Sian Green and Jonathan Rees – to the MammalWeb team, as well as multiple new collaborating organisations, and you can expect to hear more about their work over coming months. For now, however, we’d just like to say a big THANK YOU again and to wish you all the best for a very merry Christmas and a happy new year! As a token of our appreciation, there are now 3 sequences on the platform that have been modified in recognition of the season (the picture below is a hint!). If you come across one of those between now and the 12th day of Christmas (specifically, midnight on the 6th of January), you will win a brand new camera trap! If you see one of the modified sequences, please classify it as “Other” and send a copy of the picture to info@PROTECTED. You can download it by right-clicking and choosing “save image” (or similar, depending on your browser). Happy hunting, and have a great holiday! Thank you for all your efforts classifying photos this month, particularly for the County Durham Survey project. We were blown away by how many classifications everyone managed to do in a relatively short period of time, and we are really grateful! Read on to see just how many classifications were done on the project. In this newsletter, we also talk about recent changes to the website, where images on MammalWeb come from, and where to find guides to small mammal camera trapping. This will be our last newsletter before Christmas, so from all of us here at MammalWeb, we'd like to wish you a very merry Christmas, and we look forward to seeing what 2019 brings! Some of you will have noticed that we have been doing maintenance on the website over the past month. As a result, at times, the website has been running slower and you may not have been able to classify or upload photos. We'd like to apologise for this. The underlying systems on which the MammalWeb platform is built had developed a backlog of required updates, and it was essential that this site maintenance was carried out. The backlog has been substantially reduced but further maintenance is still required. We are aware of two ongoing problems that you might notice, depending on your internet speed. First, when you begin spotting, it can take a while before the first sequence is displayed. We will work to resolve this but it does seem to be a short-lived problem (with subsequent sequences displayed much more rapidly). Second, the site can be slightly "glitchy", occasionally taking a little while to respond to the "Next sequence" button, and even less frequently presenting a sequence that you have already classified (complete with your previous classification). We are looking into what causes this latter problem. If it happens to you, the best thing is to advance to the end of the sequence and click "Next sequence". We'll have it sorted out as soon as possible. If you spot any different problems, please do let us know by emailing: info@PROTECTED. As part of the site update, we've also updated the statistics that are shown when you log in as a spotter. 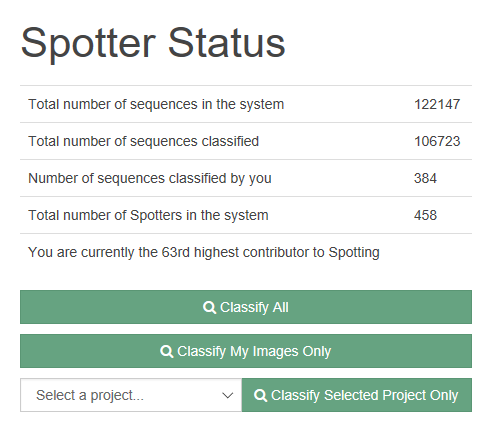 This includes your position in the spotter league table, which is based on the number of sequences you've classified. The statistics are currently updated at intervals, which may mean there is a lag between you classifying photos, and the relevant statistics being shown. Don't worry! If this happens, your classifications are still being counted; if you check back in a few hours, you should see the updated statistics. We will be increasing the frequency at which statistics are updated in due course. We hope you enjoy seeing how many classifications you've done, and trying to climb up the league table! A common feature request is to be able to zoom in on parts of images to check what, if anything, they show. This is something on our wishlist too but it might not be possible to implement it very soon (because, amazing as Helen is - and it is she who does the development work - there is sadly only one of her!). One work-around that some MammalWeb spotters use is to right-click on a photo of interest and choose "Open image in new tab", or similar. Once the image is open in a new tab, some browsers will automatically zoom in when you click on the image; in other browsers, you might need to click CTRL+ (on a PC) or CMD+ (on a Mac) to enlarge the image. If you have cleverer work-arounds, we'd love to hear about them! Where do images on MammalWeb come from? As many of you will know, MammalWeb was initially trialled in County Durham and surrounding parts of North East England. Unsurprisingly, therefore, the vast majority of the data on the site still come from that area. So far, 94 Trappers have uploaded over 500,000 images from cameras deployed at 424 different sites. Of those, 14 sites lack location data but the other 410 are distributed as shown on the map. As you can see, coverage is starting to expand from our original geographic focus. Obviously, however, we’ll have a better chance of understanding where our wild mammals occur and what affects that if we can get much more comprehensive coverage across the UK. Consequently, if you have contacts elsewhere in the country who might be interested in monitoring mammals, feel free to encourage them to get involved. In fact, with Christmas coming, now might be a perfect time to kick start their interests with a timely gift of a camera trap (starting, seemingly, from as little as £32)! On a related note, we are as interested in where wildlife does NOT occur as where it does occur. Consequently, if you deploy a camera but get no wildlife pictures, it’s still valuable to upload the data, telling us where and for how long the camera was deployed. This is most effective if you upload at least one image - so it would be worth ensuring that your camera triggers at least once during any deployment (e.g., by waving your hand in front of the sensor when you first deploy the camera, when you come back to collect it, or - ideally - both). Thank you to everyone who has been trying out their small mammal ID skills on our new project: "Small Mammal Camera Trapping". The project includes some lovely close-up images of small mammals, that were taken using a modified camera trap. If you are interested in capturing similar images, be aware that there are some helpful guides that show you how you can modify your own camera trap, and make/buy the surrounding box, on our News page. Please note that you must be logged in to MammalWeb in order to see these guides. Once logged in, see links in the articles from the 08-11-2018 and the 13-11-2018. If you do have a go at modifying your own camera trap, or are already using camera traps in this way, then we'd love to hear from you! Email us at: info@PROTECTED. Thank you to everyone who classified photos on the County Durham Survey project this month. You submitted a whopping 18,944 classifications, on almost 15,000 photo sequences, which is an astonishing achievement! We'd particularly like to say well done and thank you to Anne Kelly, Clive Moulding and Shannon McCallion, who were the winners of our prize draw, and walked away with either a £100 or £50 voucher. The project is still open and we'd like to encourage you to keep spotting on the project, as the more classifications we get on each photo, the more confident we can be about what's in the photo (see here). There are also some photos yet to be uploaded, so keep a look out on the Projects page to see when these photos have been uploaded. For now, though, here are just some of the best photos from the project. If you would like to see more great photos that have been collected on MammalWeb over the past few years (mainly from our trappers Roland Ascroft and Anne Kelly), then check out this flickr album which has been kindly made by Pen, for everyone to enjoy! Thank you for all your efforts this year, and Merry Christmas! Prizes available for classifying photos on the County Durham Survey project! We're bringing you this special edition newsletter because we need your help! As you saw in the last newsletter, we've recently made a new project available on MammalWeb: the "County Durham Survey" project. You can read more about the project on our Projects page. This survey was the largest ever camera trapping survey of County Durham, and as a result of this we have a huge amount of photos that we really need help classifying. We're offering prizes to people who help us classify images on this project over the next couple of weeks. For every classification you do on the County Durham Survey project between Monday 12/11/2018 17:00 and Monday 26/11/2018 17:00, you’ll get one ‘ticket’ in a prize draw to win either a £100 Amazon voucher, or one of two £50 Amazon vouchers! The more classifications you do during this time, the more chance you’ll have to win! 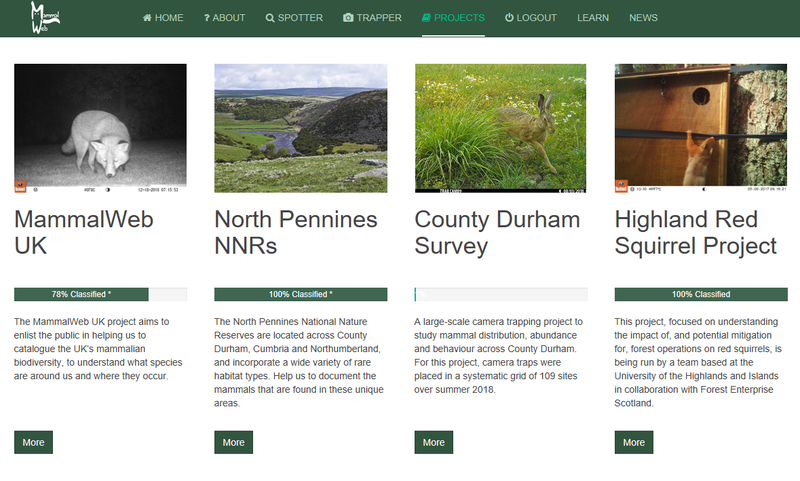 To classify images on the project, choose the "County Durham Survey" from the dropdown "Select a project" box whilst spotting. Then click "Classify Selected Project Only". Thank you to everyone who has classified images so far. We'll be uploading plenty more sequences over the coming week, so there will be plenty of images in the project for you to classify! There are some beautiful photos in the project, below are just a few we've spotted so far. If you find a great photo whilst spotting, feel free to send it in to info@PROTECTED, or click the 'Like' button on the bottom right corner of the photo, to add it to our bank of favourite images. Thank you again for all your efforts and please don't hesitate to get in touch! It's been a busy month here at MammalWeb! We've welcomed two new PhD students to our team, added a project listing page to our website, and made two new projects available. The NatureSpy team have also added a new batch of photos to their North York Moors project, so there are plenty of new photos to keep all of us Spotters busy over the next month! Read on for more information about everything we've been up to. With huge thanks to Helen, we now have a page on MammalWeb that lists all of our MammalWeb projects! Go to the 'Projects' tab on our website to take a look. If you click on "More" under any project, you will find a short description of each project. You'll also see some summary charts, such as the ones shown below for the NatureSpy North York Moors project. The summary charts draw on what is becoming a very large data base and, as a result, they currently take a little while to appear. Those will be optimised in due course to speed them up. We also plan to make it possible to link straight through to classifying sequences for any specific project. Private projects are not listed on these pages but some projects that are currently private will soon be made available for public viewing. Summary charts for a project are based on submitted classifications (rather than on strictly validated data but should, in any case, give a reasonable sense of the relative numbers of image sequences in which different species appear. They certainly suggest striking differences between the species most commonly photographed in a range of settings (including predominantly urban, entirely rural, arboreal, or with the assistance of baiting). Notice that the "progress bars" identify the proportion of image sequences that have been classified at least once. In reality, we often need more than one classification to develop a reasonable sense of what's in a sequence (see further here). Consequently, if the progress bar suggests that 100% of the project's sequences have been classified but pictures are still available for you to classify, please keep spotting! Some of you may know Sammy, a PhD student in the MammalWeb team. Sammy was kept busy this summer by rotating 40 cameras around 109 sites across the whole of County Durham. Data generated from this survey will be really valuable to help us study mammal distribution, abundance and behaviour. You can read more about the project over on our projects page. The survey generated over half a million images, so we would be really grateful for your help to classify them! There are some beautiful images among them, here are just a few we've picked out. Hi all, I’m really excited to be joining the MammalWeb team as I start my PhD, and as you may be hearing more from me in the not-so-distant future I thought I had better briefly introduce myself! As an undergraduate, I studied Zoology at the University of Reading. During this time, I was fortunate enough to undertake research on carnivores in South Africa and, as part of this, was introduced to camera trapping. Since then I have been hooked! I went on to research wildlife in Costa Rica and Tanzania before undertaking a camera trapping study of the Mount Kenya Elephant Corridor as part of my Masters by Research at the University of Southampton. More recently, I have been sharing my passion for camera trapping in Romania, where I have led volunteers on mammal surveys as part of long-term monitoring there. One of my favourite things about camera traps is how often they surprise you with what they pick up! Also, as a mammal lover, it's so nice to be able to get an insight into the lives of animals we so rarely get to see. As part of my PhD research I will be looking at ways to improve engagement, to get as many people as possible taking part in, and enjoying MammalWeb (for which I may be seeking your opinions!). As I progress, I also hope to start using all the incredible data our volunteers have worked hard to collect to start answering more questions about mammal abundance and ecology in the UK. My background is in Physics but I have decided to jump across disciplines to ecology. I will work on using Machine Leaning to improve, and to a degree automate, analysis of camera trap images. The overall aim of my project is to increase the speed and efficiency of the process, leading to the information contained in images being accessed much faster and, in turn, being put to good use much quicker. This should hopefully benefit everyone involved, including the animal species! Thank you again for all your efforts this month and please don't hesitate to get in touch! MammalWeb spotters have had a busy month classifying lots of images - just look at the figure below! We've also had some great images sent in by trappers this month, so scroll down for a selection of those. As well as this, we've got an update about the Highlands Red Squirrel Project and some information on an upcoming MammalWeb talk in Newcastle. We also highlight some computer software which might be really useful for absent-minded trappers! Some of you may have noticed that the Highland Red Squirrel Project is no longer available on MammalWeb. This is because you all did such a great job at spotting that all the images are now classified! In total, 21,123 image sequences were classified, so thank you to everyone who took part! The team at the University of the Highlands and Islands is now busy looking through the data and determining what it all means. They'll hopefully be in a position to share some preliminary results of the project with you all in our next newsletter, so make sure you keep a look out for that. One of our PhD students, Sammy, will be doing a talk at Newcastle University on the 12th October for the Natural History Society of Northumbria (NHSN). She'll be talking about some of the findings from MammalWeb so far, plans for MammalWeb's future, and what her research focuses on. Sammy's talk is one of a series of talks called the '1829 Lectures', named after the year NHSN was founded. The talk will take place at the apt time of 18:29 in Ridley Building 2, room RIDB2.1.65, at Newcastle University (see map below). Sammy's talk will be followed by a lecture from Prof. Rory Putman of the British Deer Society, on 'Wild Deer and their Management in Britain: Burden or Benefit?'. Everyone is welcome to attend. The event is free for NHSN members, and non-members are requested to make a donation to the society. For more information about the event, and to see more talks and events hosted by NHSN, see here. 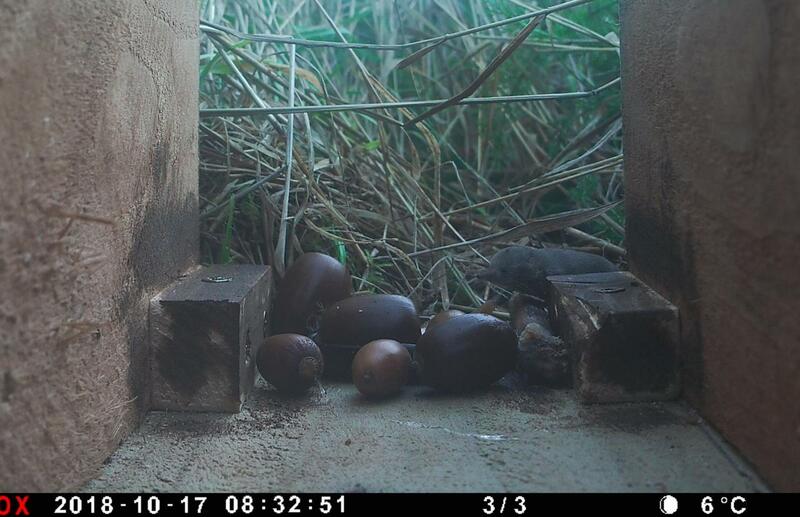 The date and time on camera trap images are really important, and can be used to gather more information on animals' behaviour and distribution, throughout the day and year. MammalWeb takes date and time info automatically from the images you upload, so it is really important that the date and time on the images are correct before you upload them. However, if, like us, you've been in the situation where you collect your camera trap, only to realise that you've put the date in incorrectly (usually owing to forgetting the camera is in US date format), then don't worry, we think we've found a solution! There is an easy-to-use piece of software, that can be used to change the date and time of camera trap images. So you can upload your images to MammalWeb and be sure that all the information will be read by MammalWeb correctly. We've written more about the software, where to find it, and how to use it for this purpose, on our News page. Note, that this software could also be used to alter the time on camera trap photos, if, for instance, you accidently set it to British Summer Time (BST), rather than Greenwich Mean Time (GMT). GMT is the time zone that should be used for all images uploaded to MammalWeb. MammalWeb trappers have shared some great photos this month. We really love seeing these images, so if you get a good one from your camera trap, then please do send it in, by emailing info@PROTECTED. Below are some of our favourites from this month. From top to bottom: A roe deer fawn, from Stuart; An otter family, from Roland; A badger, from Vivien; A stoat carrying a dead rabbit, from Helen. This month, pine martens have hit news headlines twice, after there were confirmed reports of them in both Kielder Forest, Northumberland, and Derbyshire, after many years of being absent. 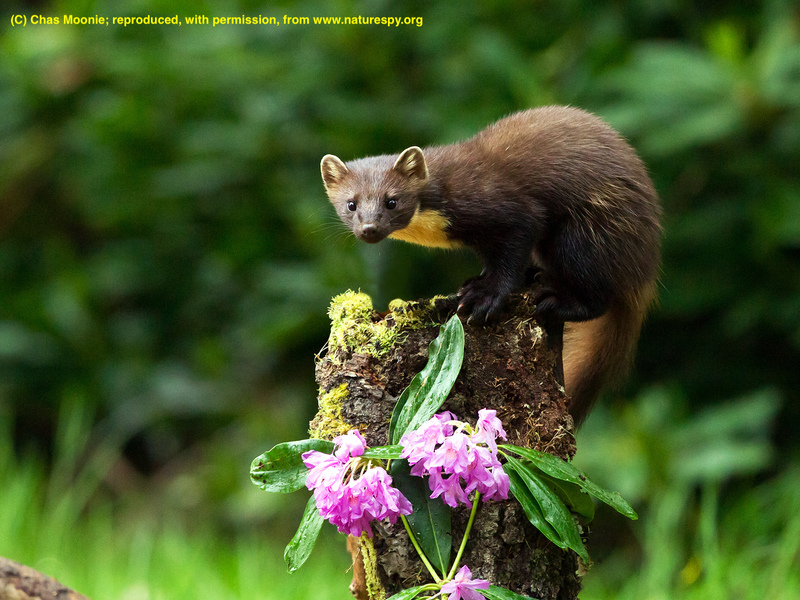 Here at MammalWeb, we have our own pine marten related news, as we have a new project available - NatureSpy's Yorkshire Pine Marten Support Programme. Scroll down to find out more about the project and how to get involved! We're really excited to announce a new partnership with NatureSpy, a non-profit organisation that - like MammalWeb - aims to engage people with the wildlife around them, and to research and conserve wildlife and habitats through study and monitoring. NatureSpy run a variety of projects and, at present, they are organising an intensive, 3-year project to study pine marten in the North York Moors. With the aid of volunteers, they are currently rotating camera traps around a variety of sites in the North York Moors, and a proportion of those traps are set to record still images. The traps yield large numbers of images and those will help to inform NatureSpy about the ecology of the area, aiding the development of a long-term conservation plan for pine marten in the area. If we're lucky, we might even see a picture or two of a pine marten! If you are registered as a Spotter, the NatureSpy images will be available to classify by selecting "Classify All" from your Spotter home screen. To focus your efforts on helping the NatureSpy team, you can select "NatureSpy - North York Moors" and choose "Classify Selected Project Only". As many of you know, MammalWeb was first set up as a local project in the North East. Hence, most images uploaded by our trappers have come from cameras located in the North East, which you can see from the first map below. We're now keen to make MammalWeb not just a local project, but a national one! We've been encouraged over the past year to find spotters and trappers keen to participate in MammalWeb from all over the country. This, coupled with input from other projects such as the Highland Red Squirrel project, has meant that now images have been uploaded to MammalWeb from different parts of the country, as you can see from the second map below. There are still many more parts of the country that we would love to see camera trap images from however. If you have friends or family who use camera traps in different parts of the country, or, in some of the more under-represented parts of the North East, then help us spread the word about MammalWeb and fill in some of the gaps on our map! We've noticed that people's use of MammalWeb's 'Like' button seems to vary a lot. Some people use it to flag particularly striking images, as we'd expect. Others, however, seem to use it to flag photos that puzzle or even annoy them, perhaps owing to an unexpected or uninspired field of view. Given that most images are seen by relatively few people, it can be hard to get a sense of what photos are really capturing people's attention. If you sometimes use the 'Like' button for reasons other than to flag a really interesting image, let us know. It might even prompt us to modify the Spotter interface! In the meantime, we thought we'd share this image of a pensive red fox (see attached), courtesy of NatureSpy, which is one of the more recent 'Liked' photos on the site. This month we've seen over 10000 image sequences, from across our MammalWeb public projects, classified! This is a great achievement, and it's brilliant to see participants enjoying classifying images from our new projects, such as the Highland Red Squirrel Project. There are thousands of new image sequences now uploaded that need to be classified, so keep up the good work! Also this month saw the first paper based on MammalWeb published. See below for more details on the paper, as well as results from a Durham University student's camera trapping project, and how to help wildlife in this heat. New paper making sense of submitted classifications! The first paper based on MammalWeb has recently been published in the journal Remote Sensing in Ecology and Conservation. You can find the paper here. The paper compares user-submitted classifications to a set of over 10,000 image sequences that have been looked at by "experts" to determine their subjects. 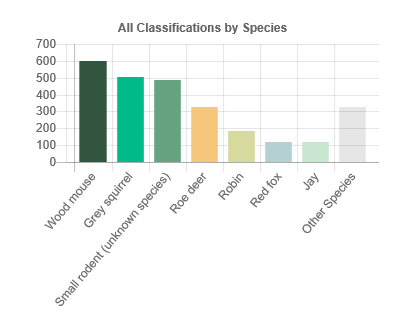 The results have helped us learn how confident we can be about classifications on MammalWeb, and we've been very pleased with the results! For example, for 10 of the commoner species, we can be over 90% sure that they appear in an image sequence, even when we have only one classification to say so! To read more about the findings take a look at our News page. We'd like to thank all of our MammalWeb participants as, through the classifications you submitted on MammalWeb, you were all key contributors to the paper. Without you, research like this wouldn't be able to happen. So, thank you, and please keep spotting and trapping! Toby Atkinson-Coyle recently graduated from the biology department at Durham University: congratulations Toby! For his final year project, Toby worked with the MammalWeb team on a camera trapping project looking at the impact of urbanisation on mammals in Durham. Toby has written more on our News page about what he did and the findings from his project. Below are just a couple of examples of the many images Toby captured during the project! 1. Birdbaths. Making a bird bath for our feathered friends is always a great way to help birds in the hotter months. Turn your garden into a space for nature by putting a washing up tub filled with cool water outside and let birds clean their feathers and then perch in a sunny spot to dry off. Leaving a bowl of fresh water out can also help our mammals out by giving them something to drink in this hot weather. However, make sure the water is only shallow, or put in a small ramp, so that hedgehogs can get out easily if they have to. 2. Take care of your garden or allotment. Plants that are watered regularly and gardens with large habitat areas are vital for butterflies and bees in the hot weather. 3. Create a nature passage. Creating a link between your garden and your neighbours enables hedgehogs and toads to move freely between gardens which raises the quality of wildlife for all to enjoy. 4. Leaving out much needed food. Finding food is also a challenge for hedgehogs and other wildlife in the hot weather. Worms usually make their way deep down into soil, making it difficult for those who usually eat them such as, hedgehogs, robins and frogs. Durham Wildlife Trust would suggest putting out a juicy snack for hedgehogs such as tinned dog food (non-fish based). 5. Add shade to your garden. Many animals will seek out shade during the hot periods of the summer and a good way to help them is by creating a shaded area in your garden so they can cool off. Create a pile of fallen tree branches in a shaded area of your garden to help smaller animals during the heat.